what is the buzz all about? and did anything change for you? since most of our blog readers are either etsy buyers or sellers (or better yet all of the above) you might also have taken an interest in the latest buzz: the changes to etsy searches. beginning in august 2011, etsy is no longer having the default search be set on recency but on relevancy instead. i can already say that i'm happy about this development. now, what etsy sellers need to do is take another look at their tiles, tags, and relevant keywords within the description. i will have to do that myself. actually, i did a quick test on the coffee cup painting last week and simply added the word "painting" into the title although i already implemented this keyword in the description and as a tag. initially my painting was on page 8 of the test search i keyed in ("coffee painting"), yesterday it appeared as early as page 4.
did this change to etsy affect your store at all? are you happy about the change? 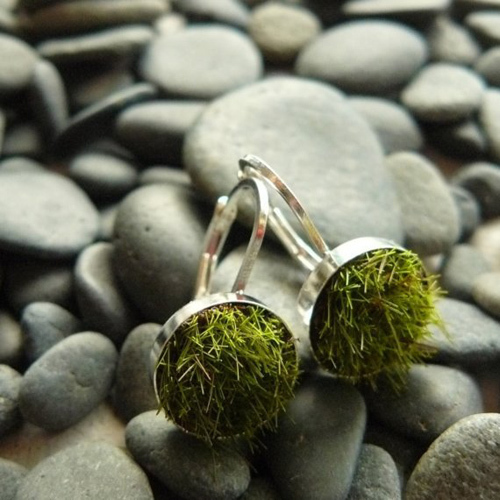 and because i believe that every post needs a picture, here is a very cool find in one of my favorite etsy shops, AdornJewelry: moss earrings. I hvaen't noticed a change (but I have a really small shop that I haven't been updating much) but teh new system sounds much more fair!